This weekend please join us for two days of community involvement, great food, and music. 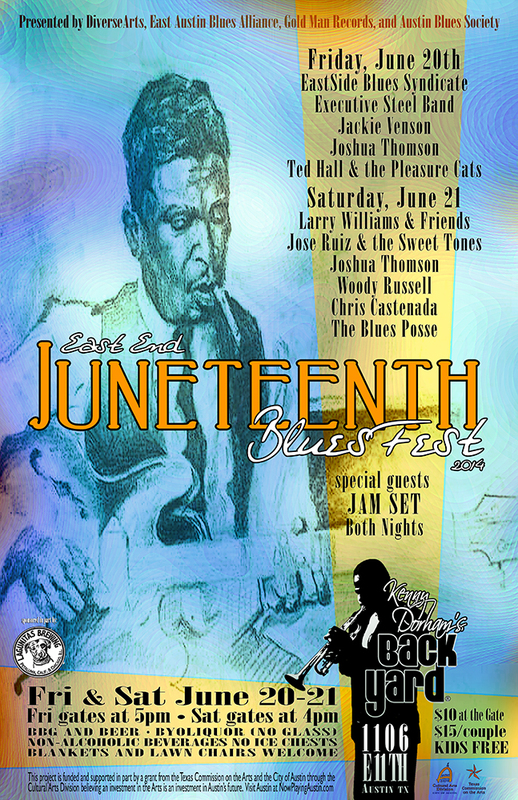 DiverseArts East End Juneteenth Blues Fest is the first official fundraiser for Kenny Dorham’s Backyard. The event will be a celebration of Juneteenth, a victory party for the Kenny Dorham’s recent lot renewal from the city and an orientation to the space for everyone who supports Kenny Dorham’s and Diverse Arts Culture Works. If you like what we do, stop by this Friday and Saturday to show your support, volunteer to participate in revamping the lot, donate, and enjoy some good music and BBQ. Free beer will be available for adults from Live Oak Brewery and BBQ will be available while supplies last. Adult BYOB (No glass containers please) | Blankets and lawn chairs welcomed. Join us for a day of music and fun as we celebrate East Austin’s vivacious community! DiverseArts Culture Works is funded in part by the City of Austin through the Cultural Arts Division and by a grant from the Texas Commission on the Arts and an award from the National Endowment for the Arts, which believes that .....a great nation deserves great art.